The dealer and the submitting person who can participate in a Stamp rally are being recruited. A dealer submitting name is also carried in a list of Stamp rally exclusive use and a Stamp rally board for the dealer and the submitting person who participate in a Stamp rally, and I appeal to a customer. When you participate in a Stamp rally, it's possible to make your booth name conspicuous.For you to push Stamp towards the customer who could come to the booth, it's also useful for communication. An sales chance also increases. A Stamp rally can participate for free of charge, so please use it by all means. You produce at least 1 item and sell goods according to this event theme. You can apply from online YOU application details change. Please select "I would like to participate in ○○ Stamp rally" in "Activity trend" and press the "Change basic information" button. It is completed if "○○ Stamp rally participation is desired" is written in the character input field of "activity tendency". Please see here about various changes after the application . 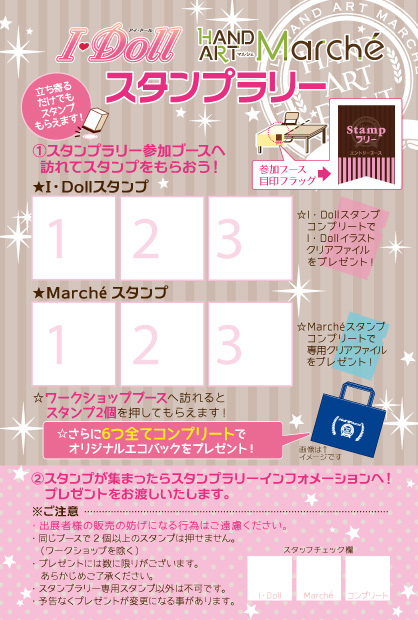 A Stamp rally set is being distributed in the event day and Stamp rally information, so please receive it. The contents of the set will be 4 points. Procedure Description Paper, Stamp Rally Special Stamp, Stamp Rally Entry Flag, Participation Bonus Present. Please take an entry flag out of the Stamp rally set and display in your booth. 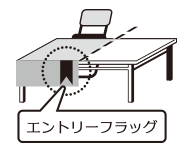 A displayed place is as shown in the right figure. Please put your Stamp rally exclusive stamp on the Stamp rally board the customer who has come to your booth has. ※ Please put only 1stamp. More than 2stamps can't be put. Please return a Stamp rally exclusive stamp to Stamp rally information after the event. ※A stamp at the nomal same booth is up to 1. More than 2stamps can't be put. ※In the workshop booth you can push two stamps. If you just visit, if you participate in the workshop, both are 2 pieces. 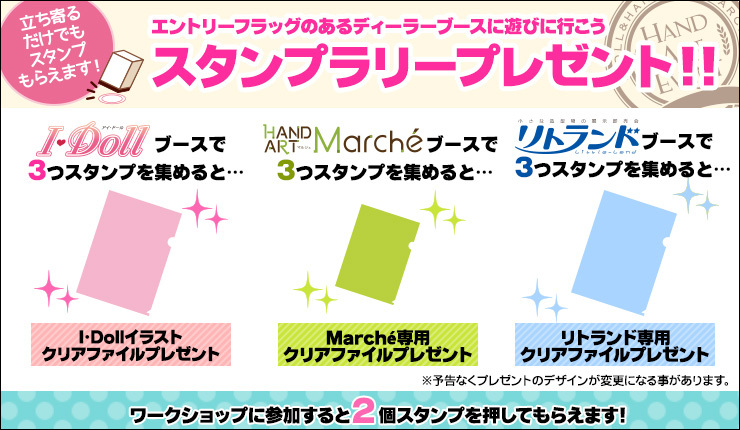 You can press either I・Doll or Marche stamp field. ※Please be sure to return a Stamp rally exclusive stamp to the Stamp rally information booth after the event. ※When ink of a stamp has not gone out any more, it's exchanged at a Stamp rally information booth. ※If it isn't understood, please ask to the Stamp rally information booth. If you feel like participating in a Stamp rally on the day, please come to the Stamp rally information booth in a head office. Even if advanced registration isn't being done, you can participate. But, the appeal by which it's for an announcement can't sometimes be done. Copyright c 2016 youmedia All Rights Reserved.